Yours truly would like to warn customers taking their Hyundai i10 vehicles to the North End outlet for routine maintenance to be extra vigilant as someone, at least, is replacing new parts with old or defective ones, giving Lippstreu Inc. BAD Publicity in the process. After my Hyundai i10 was taken in for the 15000 kilometre Service, it came back with a Rubber mat missing, the Gearlever knob was replaced with a chaffed one together with a torn rear passenger Headrest (loose stitches) upon its release. My hawk-eyed baby brother raised that rip-off and was interrogated on why it took us almost 2 weeks to report the problems. The battery was apparently also switched with an old one, because after that dreaded 15000 km Service, I have to Kickstart or Jumpstart the car after merely opening the Electric Windows or playing the Radio for 5 minutes; whereas when the car was new I accidently left it with the Headlights on at the Volkswagen parking lot for my 14:30 to 00:00 Shift. The car Started the first time around after more than 9 Hours with the lights constantly on; meaning that an old battery was been given to me afterwards. 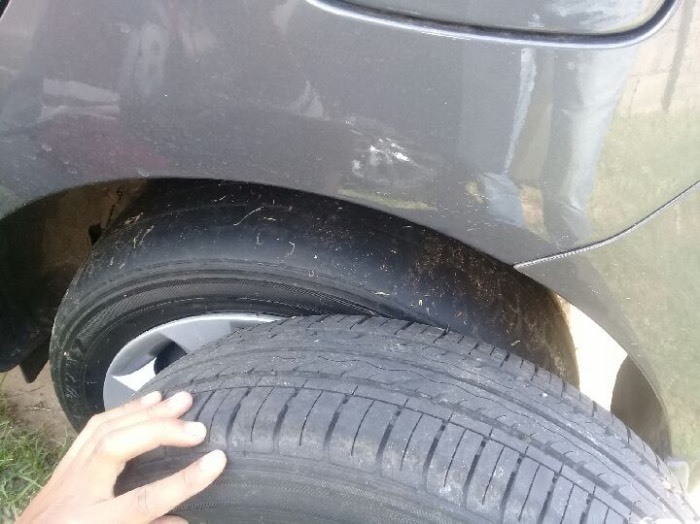 The last straw is the replacement of a fairly old tyre (30000 km) & rim with a baby-bottom smooth one and an old rim (look at the attached picture for evidence).